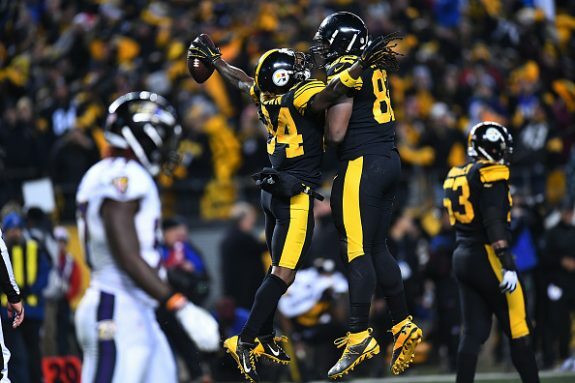 Nothing ever comes easy when the Steelers take on the Ravens, and with the season on the line Sunday night with hearts racing and fingernails bitten down as far as they can go, that point was never more evident. It wasn’t until the clock hit triple zero that Steelers fans could finally take a deep breath, coming back from the dead and then rallying late again for an improbable 31-27 win that clinched their second AFC North title in three seasons. The reward for winning the game is a trip to the playoffs, at least one more game at Heinz Field, and it continues their win streak which is now at six games after a four-game losing streak from mid-October to mid-November put their season and playoff hopes on life support. The team showed heart as well as that never say die attitude as they scored three touchdowns in the fourth quarter after trailing the Ravens 20-10, and then after Ravens fullback Kyle Juszczyk barreled in from 10 yards out with 1:18 left gave Baltimore a 27-24 lead, the Steelers again rallied one last time. Their final drive will go down as a thing of beauty, going 75 yards on 10 plays with two times out in 1:09, and ending with Antonio Brown reaching out from the half yard line breaking the plane with the ball for a touchdown with 9 seconds left to clinch the win. Brown after a slow start, grabbed 10 passes for 96 yards and the winning score, and he also joined Hall of Famer Marvin Harrison as the only players with four straight seasons with at least 100 receptions. Ben Roethlisberger started slow, throwing two bad picks as the Ravens built a 20-10 lead, but ended the night with 279 yards passing and three touchdowns, two in the final quarter. He got the Steelers off to a quick start with a first quarter drive and score to Xavier Grimble from 20 yards out to quickly give the Steelers a 7-0 lead. The rest of the first half was hard to watch from a Steelers standpoint, as the offense did little, and the Ravens converted two Justin Tucker field goals to end the first 30 minutes with the Steelers up 7-6. Things got worse as a Roethlisberger pick allowed the Ravens to convert a quick score in the third quarter to make it 12-7, and then a pass from Joe Flacco to Steve Smith made it 14-7. After a Chris Boswell field goal cut it to 14-10, the Ravens put two more drives together and with 14:18 left it was 20-10, and things looked bleak as Steelers fans were looking at their playoff hopes going down the drain. That’s when Roethlisberger and the offense finally picked it up, with Le’Veon Bell being the feature of the offense, going for 122 yards and a 7-yard touchdown that started the rally that got the Steelers back in the game at 20-17. After a three-and-out, the Steelers again got their offense going, this time with Ben hitting big plays to set up a six-play, 90-yard drive in less than three minutes which ended with Bell grabbing a seven-yard TD pass from Roethlisberger to make it 24-20. The Ravens though didn’t go down without a fight, as Flacco and their offense moved down the field slicing through the Steelers defense for what appeared to be a back-breaking 14 play, 75 yard drive that took 5:58 off the clock, and left the Steelers just enough time to put together a drive to save the season. The offense deserves credit for a three touchdown fourth quarter that again showed their firepower with the game on the line against a defense that has given them issues the last three games. The Ravens with the loss are knocked out of the playoffs, putting the Chiefs in the postseason, along with the Steelers. As of now, the Steelers are the three-seed in the AFC, and would host a Miami Dolphins team that beat them badly earlier in the year in Miami. The Patriots and Raiders are the number one and two seeds in the AFC, with the fourth seed being the Houston Texans, who are champs of the AFC South, and the fifth seed is the Kansas City Chiefs. The Steelers will play their final regular season game of 2016 at home on January 1st, 2017 against the Cleveland Browns Sunday at 1pm. 1 Comment on "Steelers Pull Off a Late Christmas Miracle; Clinch the AFC North with a 31-27 Win Over Baltimore"
A sweet victory against a Ravens team that you gotta love . It was awesome seeing Terrell Suggs walk off the field with his head down looking like he had lost his best friend after all the trash talking this guy does during the course of a season . As far as the Steelers are concerned , its the old saying , great teams arent always great, thery’re just great when they have to be . That was the Steelers against the Ravens . Ben was struggling yesterday and he knew it , but with the game on the line on the final drive he was 8 out of 10 for 75 yards and threw the winning touchdown to Antonio who made an awesome play on the goal line by stretching the ball over . Next up is a meaningless game next week against the Browns . If Tomlin is smart , Ben , LeVeon and Brown never see the field . In addition , Pouncey is a no go as well . Let these guys rest , and get ready for a tough playoff run . What Tomlin will do is anyones guess .